This will surely be a long article but I’ll discuss some fundamental concepts that will help you understand what you’re actually doing when you lift weights. And help you choose the right kind of training to achieve your goals. First, what is strength? We could define it as the ability to move a mass. The greater the strength, the greater the mass that can be moved. Simply: the stronger you are, the more you can lift. What about power? Power is the ability to apply strength rapidly. We often refer to it as explosiveness. Here’s a little example to clarify the difference between strength and power. Let’s take two athletes with the same body weight and size. The first one as really strong legs and can deadlift or squat (or leg-press) tremendous weights. The second one isn’t as strong but he has very powerful legs. Which one would be able to jump higher? Probably the second one. Even tough his legs are weaker, the ability to harness is strength over a very short period of time will make him jump higher. Finally, endurance: the ability to apply force repeatedly. As you gain endurance, you can lift the same weight for more reps.
Say you can bench press 150 lbs for 1 rep (1RM) and 75lbs for 15 reps. You train hard and you achieve to do 20 reps. Some would say that you got stronger, but in fact you are not; you’re more enduring. I doubt that raising the number of reps with such a little weight will help you get stronger i.e. make you lift more on a 1RM attempt. Hypertrophy is just another word for size or bigger volume. So these are the basics aspects you can work on when you train your muscles: improving strength, size and/or endurance. It mostly depends on the rep range you use, but other factors are involved like tempo and rest time. More on this topics later on. Most people think that bigger muscles are stronger. Right? No, not really, or at least not all the time. Strength and size are often related, but it is a little more complex than this. And depending on how you’re training you can end up with huge weak muscles or small strong muscles. Here’s why… The ability to move a weight isn’t only determined by the strength of the muscle itself, neural adaptation is also very important. The extend to which the muscle is recruited is very important and also, for complex moves, the way all the muscles are coordinated will greatly influence the strength output. And finally, the training regimen will influence the way the muscle responds. It can lead to myofibrillar hypertrophy, sarcoplasmic hypertrophy or both. Let me explain all of this in detail. When you flex your muscle, not all the fibers in it contract. Or not at the same time. This helps you vary the force you want to apply. Pretty useful not to squish a banana each time you try to grab one. 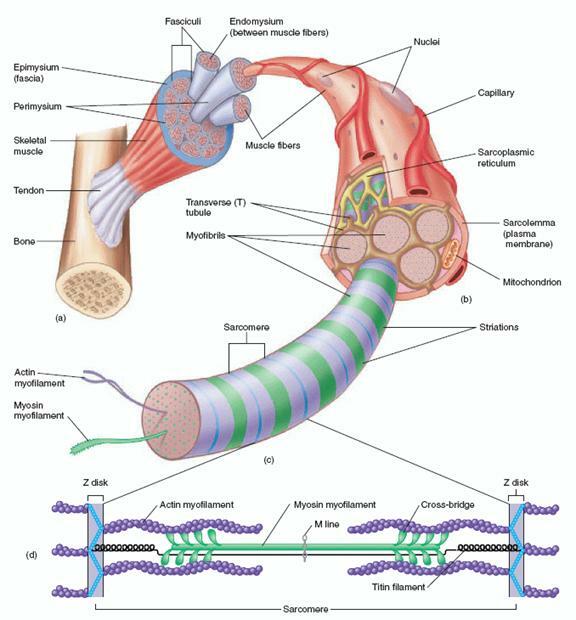 In fact, muscles are divided in bundles of fibers called motor units. When a motor unit is activated every fibers in it contracts completely (All or nothing law). But by varying the number of motor units recruited ( and the rate at which they contract) we can modulate the strength output. This means that a person can improve the ability to recruit motor unit more efficiently to get stronger (without having bigger muscles, or barely). Let’s do a little test. Chances are you’re sitting right now. Just stand-up, make a few steps and sit-down again ( or the opposite if you were standing). Was it hard? I guess not… But the moves you just made are utterly complex. They involve numerous muscles that have to be perfectly coordinated so you can do them while keeping your balance. The beauty is that this is all automatic, you don’t have to think about it, just think, get-up, and all the rest is taken care of by your CNS. But it wasn’t always like that, as a baby it took months before you could stand and walk. it’s exactly the same thing when you learn a new lift (especially compound exercises). At first it is really hard to perform, they load feels heavy and the movement awkward. As you practice, you get better, the weight feels lighter.. you’re getting stronger. But in the first weeks, a lot of this strength gain is due to muscle coordination by your CNS. This is why improving your form is crucial. A muscle is made of tissue that can contract. By being attached to the bones by tendons, when a muscle contracts it produces movement. Muscles are made of numerous bundles of muscle fibers. Each fiber being a muscle cell with multiple nuclei. Inside a muscle cell, you can find numerous myofibrils. Those are the contractile units that do all the work. The are mainly made of actin and myosin, two different proteins forming myofilaments. The myofibrils are bathed by a liquid called sarcoplasm. The sarcoplasm also contains numerous organelles like mitochondria responsible for energy production and myofibril maintenance (and growth). When you lift a load, tension is created in the muscle. If the load (and/or time under tension) are sufficient, there will be some damage done to myofibril. This mostly happens when you lift heavy weights for a few reps. Or reduce rep speed to raise TUL. When you contract a muscle numerous time without giving it the time to replenish its energy stores you’re creating fatigue. This happens when you make lots of reps and/or take really short rest periods between sets. The muscle cell will react by raising the numbers of the organelles responsible for energy production. It will also increase the volume of the sarcoplasm. This will yield great endurance gain, important hypertrophy and mild strength gains. The adaptation is quite quick but also temporary. So in order to keep the adaptation, the stimulus has to be applied regularly. If not, the muscle will go back to its former state. The table below summarizes the results of training depending on the number of repetitions. This helps determine the rep range in a training program according to your goal. The types of training for weight lifting will usually be pure strength (1-3 reps), strength/size (4-6) and size only (10-20). Of course, depending on your goal, you can undergo different training cycles to achieve the results you want. Doing only one type of training all the time will often lead to plateaus.